Leopard sleeping in tree. 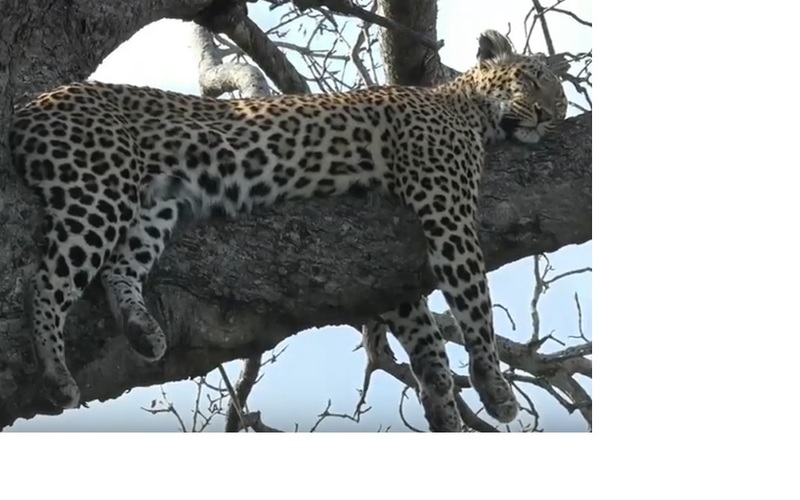 Screenshot from SafariLive. For the past four or five years, I have been watching live streaming kitten cams that broadcast the lives of foster cats and kittens 24 hours a day. This has taught me a lot about cats, about compassion, about rescue, and about human-cat relations. Recently I have expanded my viewing to another type of live cam. Safari Live broadcasts live safaris twice a day from the Greater Kruger National Park in South Africa. This is not a 24 hour a day camera in a fixed location, but a live broadcast with presenters every day around sunrise and around sunset. The broadcast is featured on two platforms, YouTube and Periscope. It can be viewed on computers (in any browser) and on mobile devices (in a browser or each platform's app). Each broadcast is three hours long. I don't usually watch the sunrise safari live, but try to watch the sunset broadcast, and if I miss them I can watch later to catch up, skipping through the video to see the parts that interest me most. Every day at sunrise and in the late afternoon, two teams go out on vehicles and one team walks on foot. Each team includes an experienced safari guide who is the presenter and a camera operator who films the experience. Viewers get to watch live as the guides find various interesting animals and plants to discuss. Unlike nature documentaries, these broadcasts are not edited and not censored, so you get to see what happens in real time, just as if you were there yourself, or better, considering the camera's ability to zoom in on distant animals. Viewers are able to ask questions on twitter or by email, and the guides answer them live. This provides an organic learning experience, where you can learn about nature in context, as you watch it, rather than in the abstract. The safari guides are both knowledgeable and entertaining, and regular viewers get to know them, their areas of expertise, and their personalities. The camera operators also make their contribution to the experience through their skilled camera work and their assistance in spotting animals. Sometimes a drone provides an aerial view, and sometimes one of the presenters is in a tent where small specimens can be viewed under a microscope. At the moment, the sunrise safari of Monday mornings is being broadcast live in the US on the Nat Geo Wild television channel on Sunday nights for eight weeks. The first 50 minutes of the sunset safari on weekdays is often broadcast in various elementary schools in North America during the morning there, and the children are able to ask questions. The guides are skilled at explaining nature to people of all ages and levels of knowledge. It always gives me satisfaction when they mention evolution during the time when schools are watching, as I understand that this subject is not taught properly (or at all) in many US schools. As an animal lover, I welcome this opportunity to see wild animals in their natural surroundings. The animals in the Kruger Park roam freely in a vast area, with minimal intervention by humans. They get used to seeing the vehicles. The staff do not feed the animals or provide veterinary care, except in very specific situations, such as when an animal has been injured as a result of human actions. This means that nature takes its course, with some animals being hunted, or getting injured by accident, or becoming sick, or starving to death. The safari shows all aspects of the circle of life, from birth to death. Viewers learn about the social structures of various species. In some cases, individual animals are given names and followed more closely, so they become stars of the show in a way that is similar to the cats on the kitten cams. Being a cat person, I was at first particularly attracted to the big cats: leopards, lions, and cheetah. I love watching them and seeing the similarities and differences between these species and domestic cats. I also enjoy seeing the mega fauna: elephants, hippopotamus, and giraffes. There are also canines: African wild dogs and jackals, and other predators such as hyenas. Reptile species include crocodile, monitor lizards, and chameleons. Primates: baboons and vervet monkeys. Other smaller mammals: wart hogs, dwarf mongoose, squirrels, and bush babies. Ruminants such as impala, wildebeest, buffalo, and zebra. Of course, there are many species of birds for bird lovers to admire, and also frogs, tortoises, and terrapins. The guides, especially those walking or in the tent, like to show various insect species and plants. I enjoy watching the safari for some of the same reasons I enjoy the kitten cams. It is live, uncensored, and unedited, and I can watch the same animals and habitats over many weeks and get to know them in depth. This sort of long-term viewing experience is, for me, the equivalent of reading a novel, while watching short video clips is like short stories or songs. The safari guides are like the foster care providers on the kitten cams, in that they provide insight and education about the things we are watching. The difference is that the broadcasts from the safari always include commentary, while the kitten cams, which are on 24 hours a day, often feature the cats and kittens on their own without human interaction. However, the safari is in some ways the opposite of the kitten cams, due to the difference between wild animals and domestic pets. The safari is aimed at observing nature without intervening, while the foster care providers work with the kittens and cats to socialize them and make them adoptable, and of course ensure their health and wellbeing. Because cats are domestic animals, humans have a responsibility to give them the best lives possible, as indoor pets where possible, and in non-breeding feral communities for those who cannot be socialized. In contrast, humans' responsibility toward wild animals is to give them back as much of their original habitat as possible, to prevent poaching, and to let them continue to live free as nature intended. The compassion we feel toward cats should lead us to intervene in their lives and help them, while the compassion we feel for wild animals should guide us in the opposite direction, to reduce our intervention in their lives and encroachment on their habitat and to accept them as they really are instead of trying to impose our way of life on them. One of the reasons for watching the safari is to experience all the aspects of the natural lives of wild animals. It is easy for us humans to romanticize or become sentimental about animals, especially if we think about wild animals as being similar to humans or to domestic pets. I consider myself a sensitive person, but I want to be realistic and rational about nature. This is why I have to learn to accept that life includes death, and predators hunt and kill. Today I saw a rather upsetting event that tested my resolve to learn about nature and accept wild animals for what they really are. The safari vehicle was following a pack of African wild dogs, a very beautiful and endangered species. Suddenly, out of nowhere, a lioness appeared and killed one of the dogs. This was somehow worse than seeing a big cat hunt a prey animal like an impala, and it upset the safari guide who witnessed it, as these dogs were his favourite species. It took me some time to process my reaction and learn to accept it, and the discussion from the three safari guides helped put things into proportion. The lioness who killed the dogs was the mother of two young cubs, and dogs often hunt lion cubs. So while it was sad to see a dog killed by lions, it would also have been sad to see a lion cub killed by dogs. Such things happen in nature, and it is pointless to become emotional about such deaths. The dogs quickly ran to another area and continued their hunt, and life goes on. In the same way, I have tried over the years to accept that some of the cats I get to know on the kitten cams might not make it. There have been several kittens who have died, while others have been saved from the brink of death and nursed back to health. With all the best medical care and love and devotion that foster care providers can give, in nature not everyone gets to live a full life. I believe that sensitivity combined with rationality gives us the best outlook on life. A friend of mine in the States has sent me a link and I occasionally watch live cameras. The other day I was watching a panda and yesterday Aurora Borealis.It's called explore.org/live-cams. AriadnefromGreece!